You drive by an intersection and take notice of a weathered and worn wooden cross poking up from the ground. Around it are faded silk flowers, some tattered stuffed animals, burnt candles, and remnants of hand-written notes that resisted being carried away by the wind. You know someone died in that spot and someone else has been grieving there. 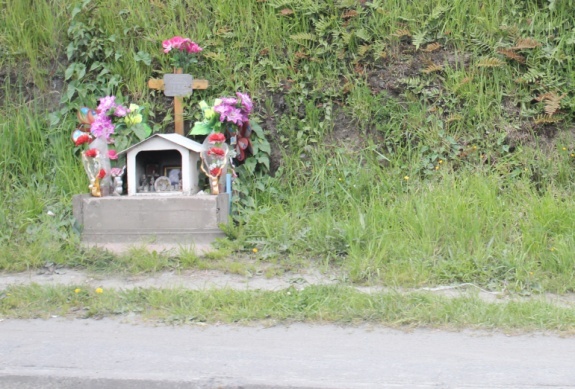 During a vacation to Chile a couple years ago, I saw elaborate memorial structures placed alongside many of that beautiful country’s roads. The shoulders were sporadically adorned with what looked like tiny, dollhouse-sized churches. Some were wooden, but most were little concrete buildings built upon concrete foundations. Inside, there were framed photographs, crucifixes, printed prayers, figurines, and candles. Flowers flanked the outsides. One display was remarkably huge—about six-feet square, with a foot-high iron gate enclosing the entire display. That one was further from the road than others I’d viewed, and I’m guessing it was on private property. Each miniature building I drove past, however, seemed to be permanently affixed to the ground. In Chile, an animita is a place where people mourn the deceased, petition for help, and give thanks for answered prayers. I remember that as a teenager I watched old western movies. Whenever one of the good cowboys was shot to death, his comrades did all they could to bury him. If they were on the run and in a hurry, they quickly covered him in rocks. If given a little more time, they dug a shallow grave, covered the body in dirt, and marked the site with a makeshift cross. People have been memorializing the dead for centuries. Egyptian kings have their pyramids. In India, the Taj Mahal houses the body of an emperor’s beloved wife. Here in the United States, the wealthy erect mausoleums too, although they are admittedly much smaller. All of us will die, but only some of us will plan for our inevitable demise. In the 1980s, a popular advertisement encouraged people to select the ingredients they wanted on their pizzas by answering: “What do you want on your Tombstone?” It made a normally serious topic light and fun . . . and, in particular, tasty. It was genius. The Tombstone Pizza Company name wasn’t easily forgotten, even all these years later. The ad worked in part because it made us face our own mortality for just a moment while we pondered how we wanted to be remembered. What would people say about us after our deaths? 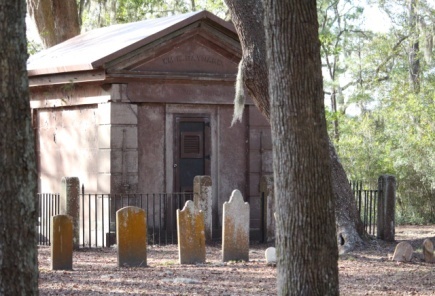 Built in 1846, William Eddings Baynard’s mausoleum is the oldest standing structure on Hilton Head Island, South Carolina. Frankly, if we don’t convey careful instructions or plan ahead of time, we aren’t the ones who decide what goes on our pizza or what gets written on our own granite tombstones. Let’s hope that the immortalizing words associated with us end up being written by someone who abides by our wishes or at least likes us enough to say nice things. You can learn a lot about a person by visiting his or her gravesite. For some reason, that fun isn’t high on the list of any of my friends and family. Rarely does anyone ever want to join me in a stroll through a graveyard. Yes, I’ve actually asked family and friends to do that, especially during travel to foreign countries. Most often, the closest I come to walking hallowed ground turns out to be nothing more than a chance drive-by encounter on the way to some other point of interest. 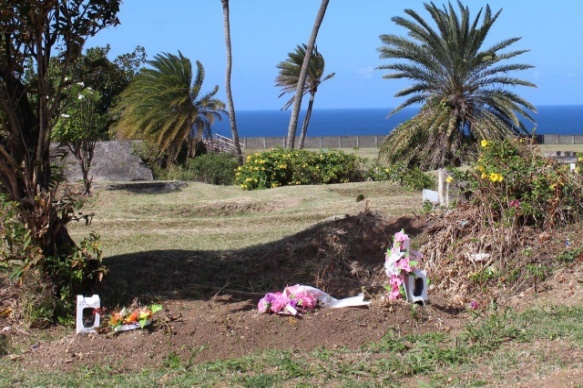 The one time my husband, his sister and her husband humored me, we delicately tip-toed around the fresh, loose soil of above-ground graves in a church cemetery on the Leeward Island of St. Kitts. We visited long enough for me to take several photos. An eternal resting place on St. Kitts overlooks the Atlantic Ocean. When I noticed that my companions weren’t walking alongside or trailing behind me, I realized that they didn’t share my curiosity over the differences in Kittitian burial customs from those in the United States. I saw that my family was lingering near our rental car and I figured it was time to go. We hopped back into the new Honda CRV. Then we accidentally drove over a metal industrial anchor of some sort. After incurring over two thousand dollars in repair costs to the rental car, certain relatives don’t want to stop at cemeteries with me anymore. That’s one explanation for why I, more cautiously, poked around the internet this month and found a variety of interesting memorials to share with you. 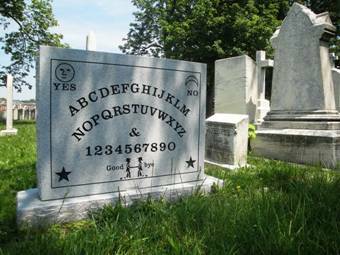 Elijah Jefferson Bond, the patentee of the Ouija board, was buried in an unmarked grave at Maryland’s Green Mount Cemetery in 1921. Eighty-seven years later, a Ouija board collector, enthusiast, and expert, Robert Murch, successfully located Bond’s grave. Murch obtained all the necessary permissions and funds needed to erect a memorial headstone. He commissioned a clever and befitting design to honor the deceased Mr. Bond. Bond’s once unmarked gravesite could have been permanently forgotten, but that’s unlikely to happen now that he has an intriguing monument. Yet, I wonder: would Bond have chosen to rest beneath a granite version of a game that encourages conversations with dead people? Someone is bound to ask him, via a Ouija board, although it won’t be me. I don’t want to open that creepy door to the spirit world. We give thanks for the life of a woman I am so proud to be able to call my sister. The unique, the complex, the extraordinary & irreplaceable Diana whose beauty both internal and external will never be extinguished from our minds. I think all those complimentary words would be well-received by Diana. The temple, in my opinion, is a bit much, but she was a princess. Most people wouldn’t expect anything less than extravagance like that for a woman loved throughout the world. Another ideal tribute honors author Walter Lord. His gravesite is identified by a stone bench, inscribed with the names of his best-selling books, one of which was A Night to Remember, about the sinking of the Titanic. The welcoming setting invites visitors to rest for a little while, maybe even with one of Lord’s popular books in hand. That’s a nice thought for us mere mortals to aspire to. The land beneath the dome in Jerusalem is revered by Christians, Jews and Muslims, although for different religious reasons. Covering a rock where Muslims believe Muhammad ascended to heaven is a shrine known as The Dome of the Rock. In Jerusalem, it stands out from all other buildings. There’s no mistaking the ornate memorial, topped in gold. 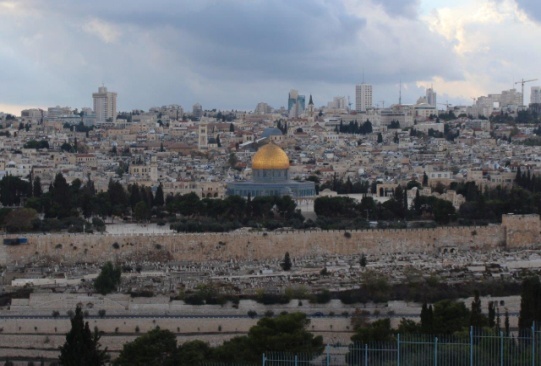 During a trip I took to Israel in 2014 with my church-family, Christians were not welcome within the shrine’s doors, so we appreciated the splendor from afar. That was okay with me. I had another, personally more meaningful, tomb to visit. This other one, known as the Garden Tomb, was literally fit for a king. Not because it was extravagant or ornate or covered in gold. It was none of those things. There was nothing fancy about this other tomb. It was simply a cold, barren cave with a hard, stone floor. 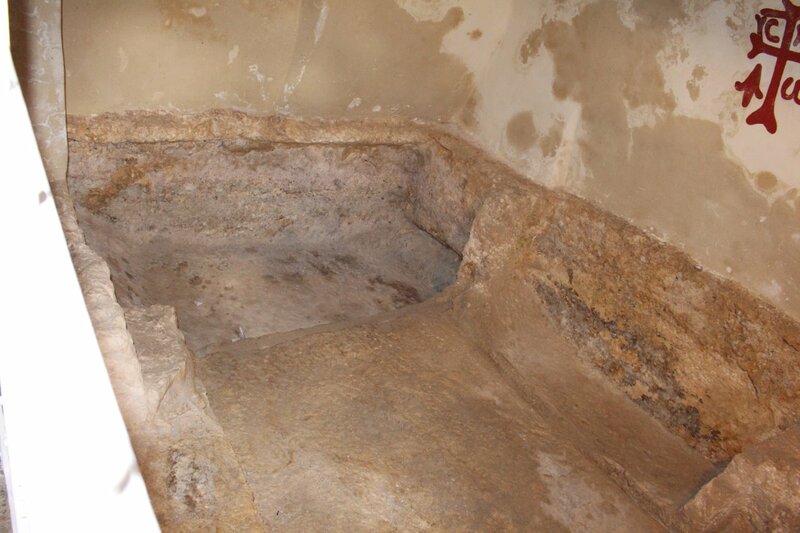 It was a tomb that long ago may have been customized to accommodate Jesus’s body. Some people believe that the King of Kings was too tall for His borrowed burial space and it had to be chiselled and lengthened to accommodate His height. 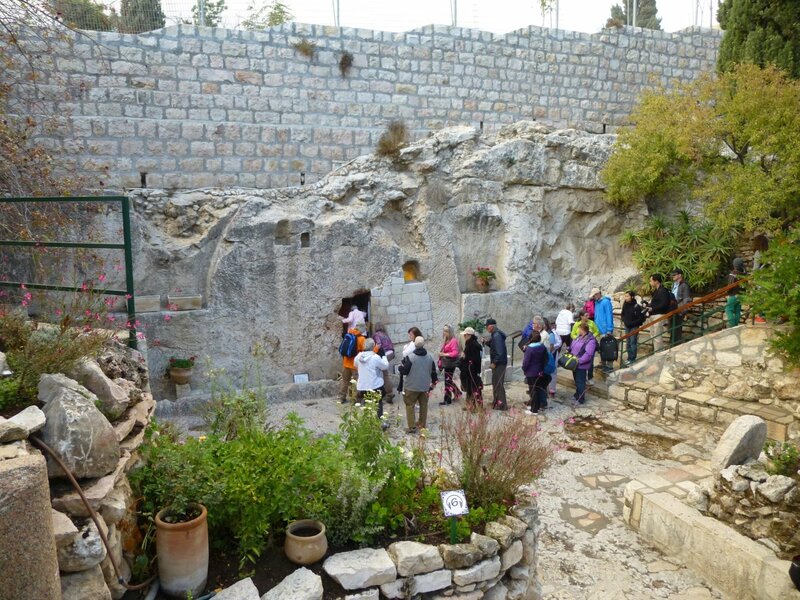 Others more simply acknowledge that the Garden Tomb’s characteristics match historical records of Jesus’s burial. Either way, this place in Jerusalem is where people come to pay homage to Jesus and to pray. I entered the solemn tomb and stood with my pastor and his wife. My pastor was weeping. In that moment, I recalled the torture Jesus endured before His death. I cried too. If anyone deserved a shrine or a temple, it was God incarnate Who sacrificed His life for the redemption of my sin. The grounds surrounding Jesus’s burial tomb are full of flowers and plants, and there are many sitting areas that inspire personal reflection and prayer. Nature’s beauty helps comfort us in our grief. But the stark reality is that we mere mortals die. Those left behind visit gravesites, leave flowers, tenderly care for the little plots of earth where our loved ones rest. We continue in conversation with those departed. Our greatest comfort, however, comes from knowing we’ll see them again. I like the insight you give about different cultures and their rituals about death. Nicely done! I hesitate to read your posts, saving them for a time when life is quiet and I can read them slowly, for I know that I will be regretting the end. Once again, the experience was the same; I’m left craving for more. I’ll be one of the first to buy the book. Blessings to you and your family, Kelly! Noreen, your encouraging words fuel my passion for writing and help me justify all the time that I steal from other endeavors in order to pursue my grand desire. Thanks for believing that I’ll get it done. Love and hugs to you and yours. Kelly, Dare I say it? This is your best post yet – well done on so many levels. I did not know we shared this cemetary obsession – the curiousity for what happened and an appreciation for time softening the finely etched words, tilting a headstone or reducing it to rubble. Happy Easter! Karen, thank you so much. I’m glad to know we share interest in cemeteries. They’re a great source of inspiration, and your affection for them is made clear through your kind words. With this post, I had fun squeezing in each of the topics I like to write about: people, travel, and God. Happy Easter to you too! Phil, that is a beautiful epitaph, and one that greatly honors your father. The truest tombstone I ever read was, “To live in the hearts of those you leave behind is to never die at all…” over my father’s grave.